Feng Office is an open source web based collaboration platform which allows businesses to manage project tasks, billing, documents, communication with co-workers, customers and vendors, schedule meetings and events, and share information. All the information managed by the system can be linked. 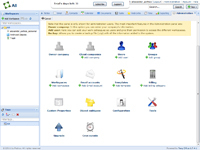 The software package include calendar, text editor, task manager, document manager, notes manager, contact manager, web links manager, e-mail and time managers. Feng Office offers two types of services: Feng Sky – the easiest and fastest way to get started, you create a Feng Sky account, and get started in minutes; Feng Onsite for enterprises that need a solution installed in their own servers.